RT-AC68U Dual-Band Wireless-AC1900 Gigabit Router is rated 4.6 out of 5 by 155. Rated 2 out of 5 by Zuck from If at first it doesn't succeed do you try again? I updated the firmware and installation was a snap. It worked well with wired connections from the start. It never worked correctly with wireless devices. I worked with Asus tech support and we reset the router. We had to connect/disconnect wireless devices to the router 3 or 4 times before the device would show on the routers connected device list. Asus Support told me this was normal. Not normal for me. The devices would function for about 10 minutes before dropping from the network. A new DELL windows 10 laptop never could connect Wi-Fi. Asus Support recommends returning the router to determine if it is simply defective and try again. Asus Tech Support was ineffective. Rated 2 out of 5 by Josh - NJ True Paranormal from Trouble in River City This device is a plug and play. I updated the firmware and installation was a snap. For the first day it worked well with strong connections on multiple devices throughout the whole house. The signal strength is unmatched. The second day, the router failed. I worked with Asus tech support and we reset the router. It would function for about 4-8 hours before failing each day. It was on, but I could not access the wireless or WIRED connections. I am returning it to determine if it is simply defective as to the conclusion of Asus Support. Asus Tech Support is ineffective and has difficulty communicating. Rated 5 out of 5 by Anonymous from Great Router Replaced a 4th generation Airport Extreme with the ASUS RT-AC68U. Configuration was very easy. Updated the firmware version with ease. Turned on both 2.4 and 5 GHz bands. I keep public off until we need it. The public access can be configured with a limited life. 1 hour for example. Reduced the number of IP Starting-Ending Addresses. All of our wireless/handheld devices have a manually assigned IP based on MAC. Signal strength is excellent 80 feet away from router. This is outside of house. The ASUS appears to be marginally stronger than the 4th gen AE in this regard. The ASUS router has more function than I need right now. Rated 5 out of 5 by Gerald from Big improvement. Works as advertised. Purchased to replace an older LinkSys router on my home mesh network (two routers). I have large ranch and cable comes in one corner, MBR in other corner (~75' away). Unit was easy to configure and was up and running in a few minutes. All devices were able to stay connected except smartphones on low batteries. I added my newer old router (Belkin 465) back as a mesh access point and we're all set. No dropouts in two weeks. I used to have to reset every two days. Speed is superior. ASUS has some nice apps that go with the router. They work well but some features required forgoing some privacy settings so I'm not going to use them. Rated 4 out of 5 by Beta Antares from Solid 802.11ac Was looking to replace my old 802.11g. Did not care for the high price nor the funky mothership designs of the current top-of-the-line 802.11ac routers from Asus or Netgear. This little fella on the other hand can sit on your computer desk without looking like a rejected prop design from the Aliens movies, is mature, stable, and solid. Signal is strong and speeds seem good, even with encryption enabled. Stock firmware is a little weak (not too many options, e.g. hardware firewall and port forwarding), but I've reflashed to Asuswrt Merlin and it is way improved. Also wish it came with 8 LAN ports instead of just 4, but alas poor Yorick. Rated 5 out of 5 by Richard from Streaming heaven purchased this with asus usb-ac56 adapters. I upgraded firmware for both router and adapters prior to setting up network. I purchased this router for a wireless streaming requirement in a temporary house for several devices, streaming 20Mbps each, and it handles it all with ease. ac56 utility reports 867Mbps speed band ac. it is stable enough to enjoy streamed br movies, but there are other times when the connection backs all the way down to g. these sketchy times are few are far between, but I am sure it is not the router or adapters. I consider this router and adapters dependable and worth the price. Rated 5 out of 5 by Mark from Literally the BEST ROUTER I've ever owned. Honestly, this was one of the easiest setups of any piece of equipment I've ever owned. I had it up and running in literally 15 minutes. That even included a firmware update. The web interface is awesome. It's been on now for three weeks, and has not gone down once. This thing is fantastic. I could not recommend it more. And B&H has the best price! (as usual) One last thing...it actually looks very nice. The LED lights aren't too bright, and the cool pattern on the outside is nice to look at. This router is absolutely fantastic. I give it an A+. Rated 5 out of 5 by Geraud from Fast router, easy to use This is a router I use for my home office. The clients connected to it are both wired and wireless. With a 200 Mbps connection, I am actually seeing the same overall speeds on both Wifi (5GHz class AC) and gigabit ethernet wire. To benefit from it, you will need to have modern devices, but your future computers/phones should be able to benefit from the speed. It was very easy to setup, both as an initial use (all DHCP), and for advanced settings (aka part fixed IP based on MAC, NAT, etc) One feature that can be easily missed but I found a nice addition, is the possibility to switch off all the LEDs. This is something very useful to not get distracted at night by network activity! 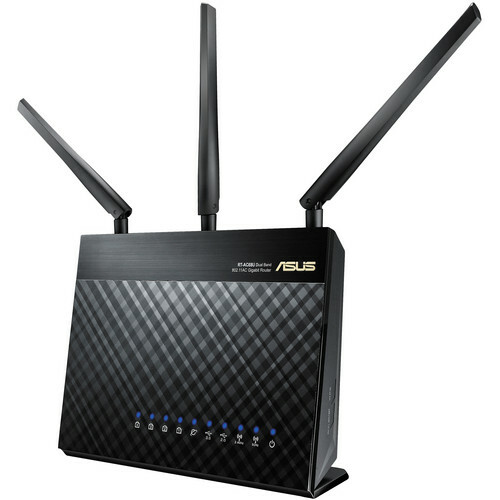 ASUS RT-AC68U Dual-Band Wireless-AC1900 Gigabit Router vs. Linksys EA9200 AC3200 Tri-Band Smart Wi-Fi Router. Which is the better router? Of these 2 options the Linksys would be a more powerful router. it includes TriBand technology which give you two 5GHz Wi-Fi bands to deliver the fastest possible speeds for all connected devices. the Asus is a very good router with Very solid performance. Will this work with the Standard Verizon Fios Modem or do I need to buy their Quantum Modem from them first? And if this will work with it, do I take an Ethernet (Cat 6),Cable and connect it from one of the the Fios Modem's LAN ports to the WAN Port of this Router or am I looking at things backasswards? Please send an e-mail to askbh@&lt;a href= http://bhphoto.com target= _blank &gt;bhphoto.com&lt;/a&gt; with the model of the modem / router that you are connecting to. Chances are it is a router, not just a modem, and this can complicate things. Are the antennas detachable? If yes, what is the connector type? I can't make it out on the picture. Does ASUS RT-AC68U Dual-Band Wireless-AC1900 Gigabit Router can be configured to work in media bridge or bridge mode? Yes it does. Make sure to get the latest firmware, it's a great router. Can the Asus RT-AC68U handle 30+ devices at once? Most wireless access points and wireless routers can theoretically have 255 devices connected at a time. That represents a lot of computers, smartphones, tablets, cameras, and other devices and probably far exceeds the needs of the typical home. The speed of your internet as well as layout of your home will effect the speed on multiple devices as well. The internet connection I have is a cable modem. Good speed.I hve two teenagers on laptops gaming / streaming at any given time. There is an XBox 360 and an Xbox One the kids rooms that are active on the net as well.I have an adult female Facebooking and streaming often.I also have been known to do these things too.And as many as 4 to 6 cell phones connected to the Wi-Fi at any given time.I have an Windows XP machine with RAID array that I use as a file server. I wanted to replace that with a HD attached to the router. My Cisco EA3500 is also proving to be really pathetic. I miss my old WRT54GS.Given the situation I laid out above, is the RT-AC68U a good fit for me? That's an important question! It has a powerful processor and a decent amount of RAM. Those features add up to a loose or unofficial tech designation called, Internal Bandwidth. The Internal Bandwidth of this unit is very good for the environment you've described. my rt-ac68u system is asking me for a host name but I don't what to put in there. can you help me? It should not be asking you for a host name.....since non is required. It may occasionally prompt you for a login name to make changes in your router. In the WAN section of your router's menu there is a place to enter a host name, and is only required if your ISP requires it. Mine is empty.Now....on the other hand......I have a unique set-up. On occasion if my Wimax2+ modem fails (my ISP) then occasionally when I try to connect to a webpage it will prompt me for a host name or user name. That is just a indicator that you have somehow lost connectivity to your WAN or that your DNS has stopped working for whatever reason.Unless it is happening all the time.....or if you cannot connect to the internet at all...I would not worry about it too much. But if it is happening often.....might be a good ideal to both update the firmware (and in some cases revert to an older version) and reset the router to factory fresh settings. The list of compatible operating systems for Asus 68U does not include Windows 10? Has it been upgraded to enable you to take advantage of 10's network management functions? I use Windows 10 and this router without a problem. They are compatible.